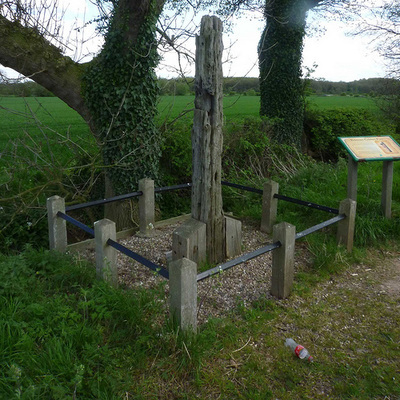 Whilst not technically a Local Hall I was keen to add this item as it is a really interesting piece of history that many may not be aware of and which may not be around for ever! 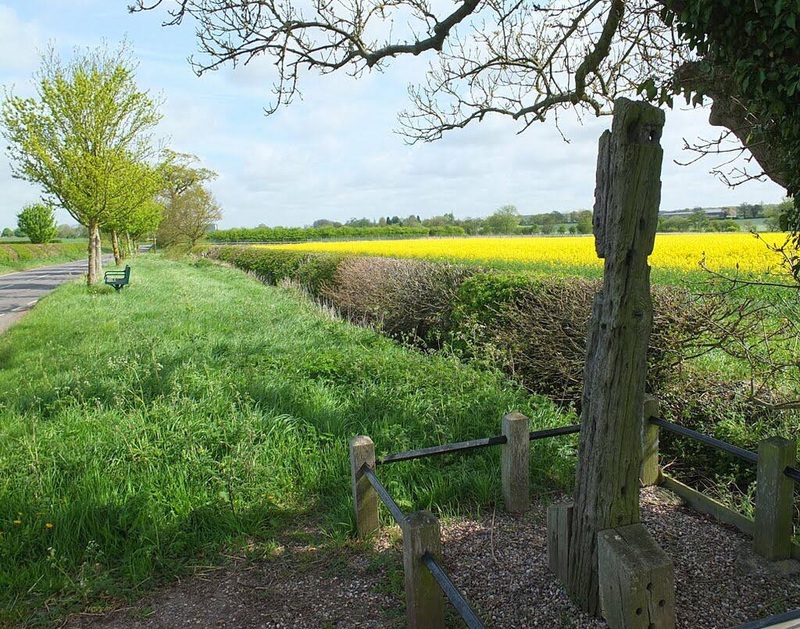 There is a picturesque former water mill to be seen in the tiny hamlet of Bilstone just over the border in Leicestershire. In 1801 a short distance from here, John Massey - an agricultural labourer - lived in Keepers Cottage with his new, second wife and her 10 year old daughter. He was described as a hard drinking, short tempered, wrestler. 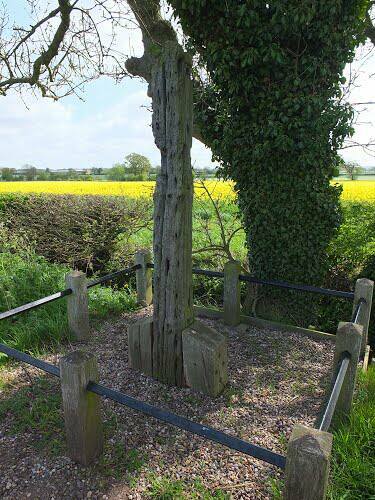 After a drinking bout in the Curzon Arms, Twycross, he returned home and had a violent row with his wife. 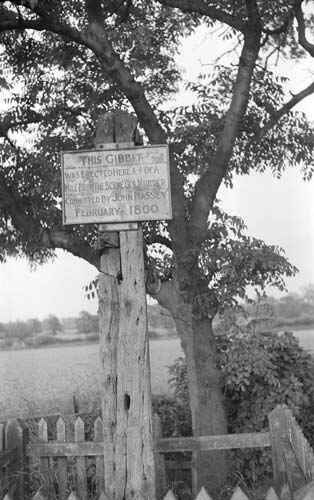 He threw his wife into the mill race, where she drowned. Her daughter who tried to intervene was also thrown in but escaped with the help of the mill keeper. 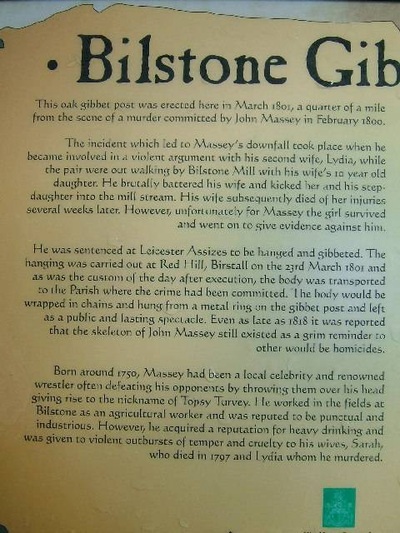 Massey was arrested, charged with murder and convicted at Leicester Assizes. He was hanged at Redhill, Birstall. 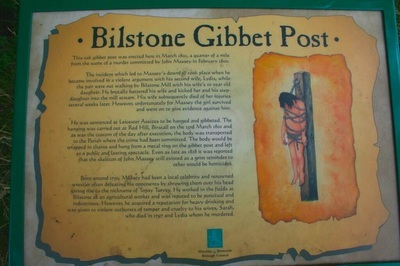 His body was taken to a gibbet post about half a mile south of Bilstone on Gibbet Lane. 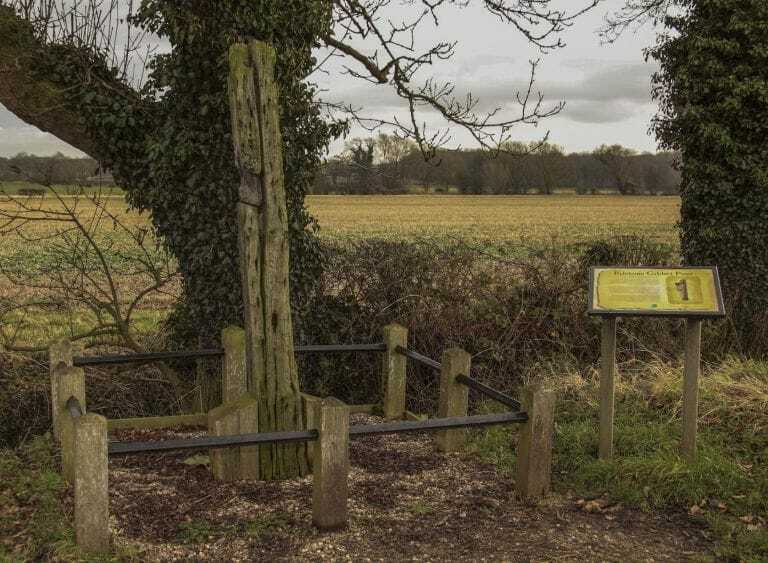 According to the custom of the day, the body was wrapped in chains and hung from a metal ring on the gibbet post about half-a-mile south of where he had lived, and hung there for the next 18 years. 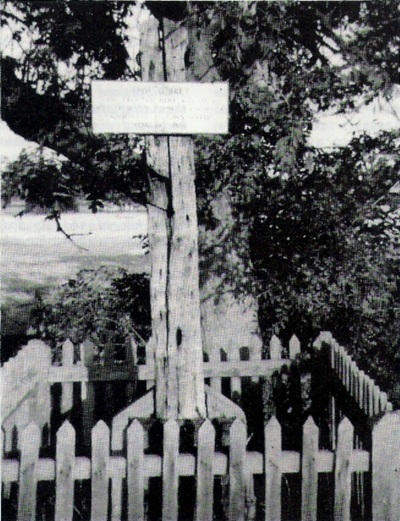 By the time it was removed, just a partial skeleton was left. 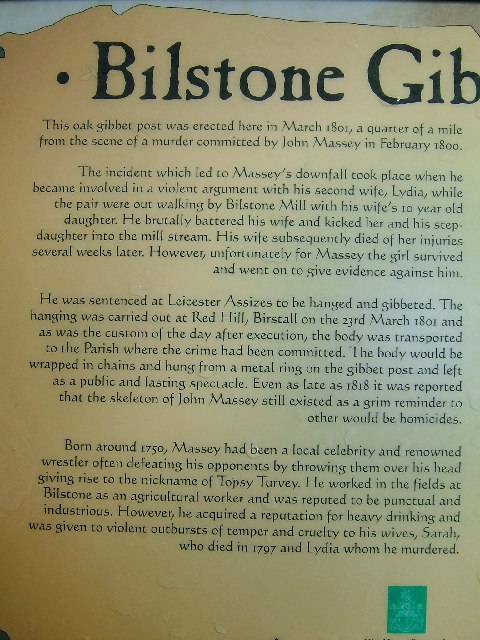 Apparently, John Massey's skeleton could still be seen on the gibbet at Bilstone as late as 1818! 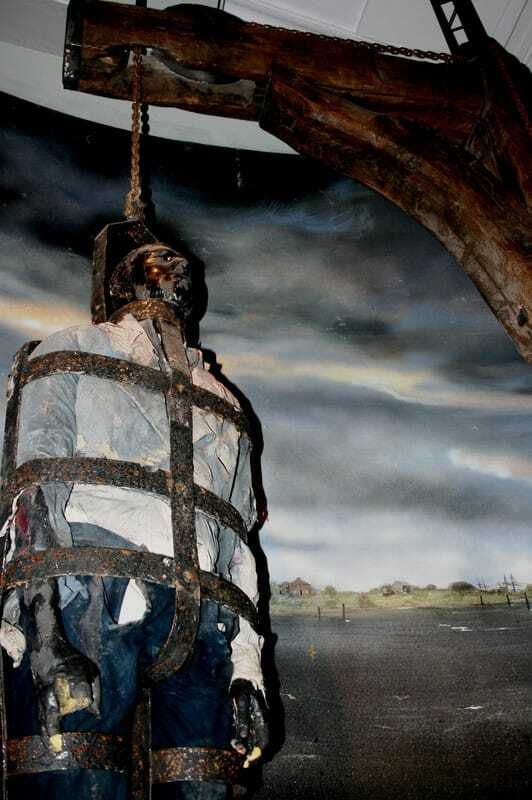 The practice of displaying convicted murderers in gibbets – an iron-framed cage which kept the body from falling apart – was abolished in 1834. 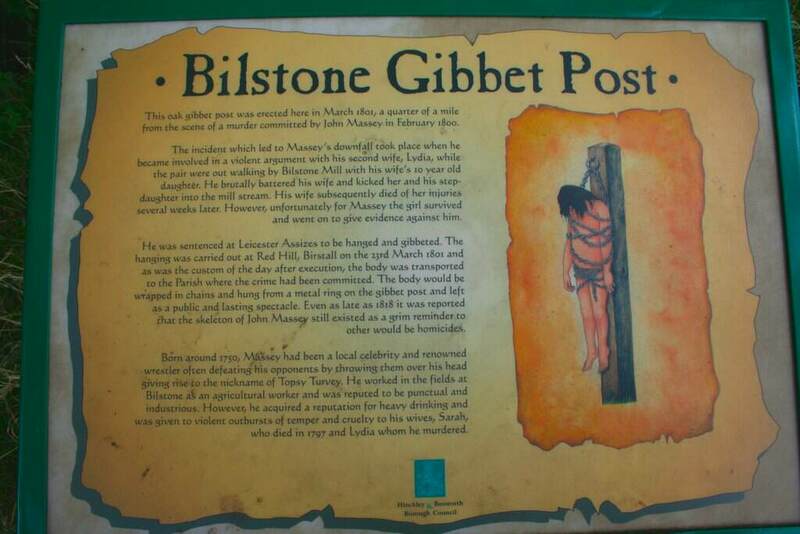 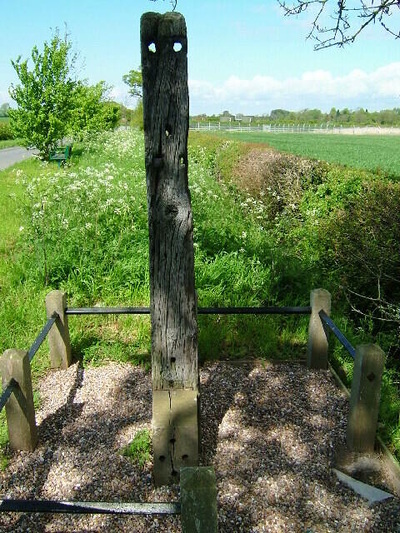 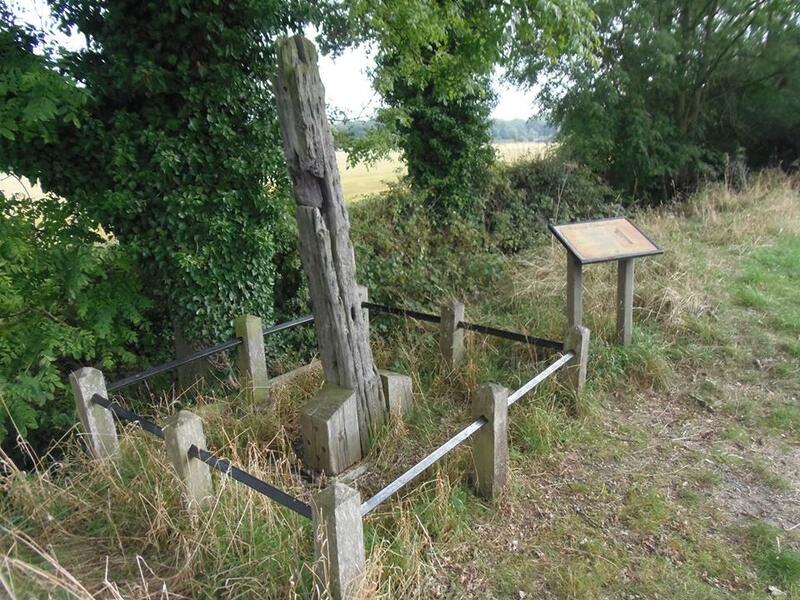 ​You can read more about the Bilstone Gibbet in an article by The Leicester Chronicle here: The Bilstone Gibbet. 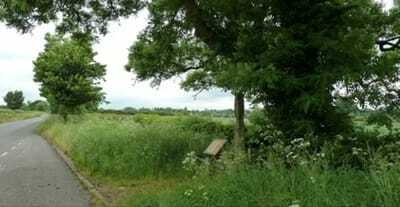 A brief aside from myself. 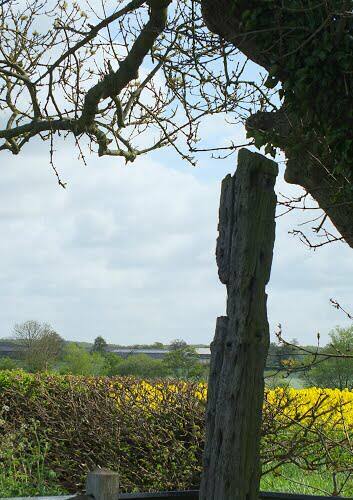 A friend of mine back in late 1980s used to go out in the area to watch stars, as he was a keen astronomer. 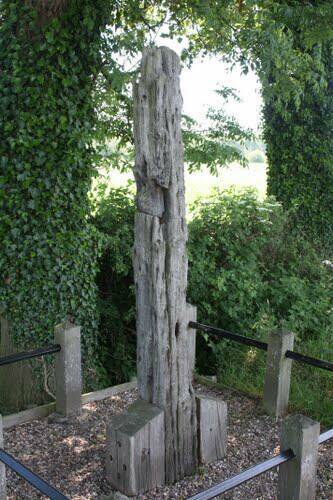 One night he was in the area when a car pulled up at the post, a screech was heard and then the car drove off. My friend went to look and saw that a chicken had been killed there!